The New European seems to run counter to intuition about launching a newspaper in the UK today. But that could be the secret to its success, says launch specialist Five by Five's creative director. Has there ever been a worse time to try and launch a newspaper? Circulations continue to nosedive as readers get news online rather than from the papers. A whole generation has never got into the habit of buying a daily paper, while many of those that did are now losing it. So what chance for a new "pop-up" paper aimed squarely at less than half of the population? 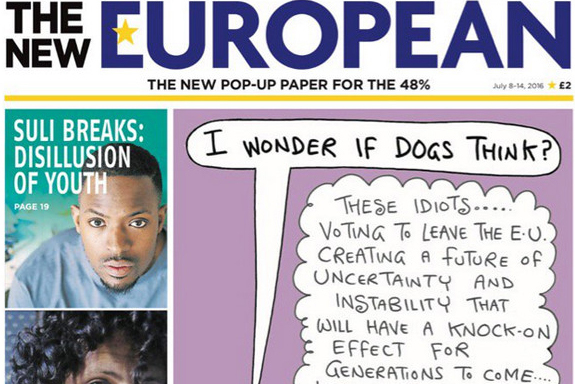 Archant’s The New European did indeed pop up last Friday – the first of four planned issues – but will it just as quickly sink? On the surface it might look insane to launch a newspaper right now. This year has already seen the demise of two national daily papers in the shape of The Independent, which is now online only, and The New Day, which lasted only nine weeks before Trinity Mirror pulled the plug. Looking at the experience of these two titles, The New European seems to have very little chance of survival. It is targeted at a, admittedly big, niche audience, the 48% who voted to remain in the EU; the subject matter based around the politics and culture of Europe has limited appeal; its distribution is select; and it costs £2 a copy. Archant could hardly have introduced more barriers to its success. However, that does not mean that its launch will be a failure. One of the strongest points in its favour is the clarity of the proposition. Archant has clearly defined who the audience is – the people who feel disenfranchised and frustrated by the referendum. There is also little doubt what the product aims to deliver – a powerful and partisan articulation of what it means to be European today. This is in sharp contrast with The New Day. Its professed politically neutral pitch seemed out of touch with these polarised times. In trying to appeal to everyone, it ended up meaning not very much to anyone. The New Day was also wedded to a traditional vision of what newspapers are and can do. As a weekly, The New European is freed from the need to compete on scoops and breaking news. Instead, it is about providing context and commentary, and an acceptance that the purpose of newspapers has changed. People haven’t stopped liking news, they just stopped using newspapers to get breaking news. People turn to newspapers, or at least newspaper sites, to help put what they read on the Internet yesterday into context and also deliver big investigative pieces. The focus on the 48% is also interesting. These are predominantly, although not exclusively, younger, more metropolitan and more liberal. This is the last audience that you’d expect to go back to newspapers. But a newspaper that’s about their disenfranchisement and the things they care about exclusively could become a badge of honour to them. Reading a copy of The New European on the tube makes a statement about who you are. By all accounts, the launch of The New European has been a rushed affair – how could it not be, given that its genesis is the shock of events of the past few weeks. This is not necessarily a negative, and the team behind it has used Silicon Valley type language, rather than newsprint. Describing it as a "pop-up" newspaper and having a hacker feel plays to that sort of fail fast ethos. It’s a beta product and they will iterate based on the feedback they receive over the initial four weeks of the paper. Every issue will be a referendum on the next. That’s exciting and in tune with the rapid pace of events we are seeing at the minute. Whether the launch of The New European can succeed where The New Day failed is yet to be seen. It all comes down to content. If they have stunning insight, an exclusive interview or a revealing investigation, you never know. But they have to bring something different to the party. It is an exciting approach that steers away from the orthodoxies of newspaper launches. By being counterintuitive it could be a success. Or it may be remembered as a glorious failure – an attempt to do something genuinely exciting and different. At any rate, I have to admire their bravery.